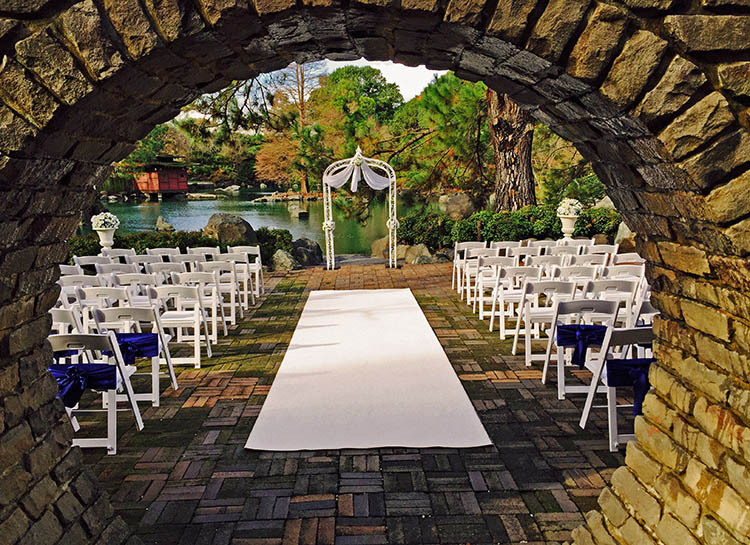 The Auburn Botanic Gardens is a fantastic location for small intimate outdoor wedding. There are 2 lakes and a waterfall with a number of gardens to choose from and each having its own look and feel, the gardens create a perfect backdrop to any garden wedding. The Japanese Garden is a beautiful area that overlooks the garden pond. It’s a wonderful spectacle during the Cherry Blossom season (August to early September) if you’re planning a winter wedding and the symbolic blossom that represents beauty and the fragility of life will accentuate the special occasion. Creating an amphitheatre effect, the Aubrun Botanic Gardens, Sunken Rose Garden caters for a medium to larger outdoor wedding ceremony. The space allows for the hire of more white wedding chairs, and wedding ceremony decorations to enhance the garden setting as seen in our image below. A large arch that sits over the steps creating an opportunity for a colourful floral wedding decorations and creative arrangements in colour or a simple and elegant wedding white. 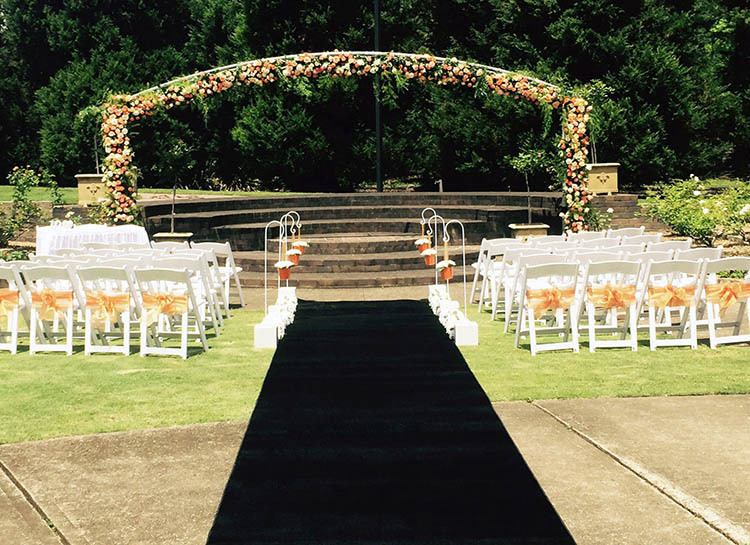 The wedding ceremony image below was an orange and black decoration theme which came up spectacularly with the black wedding aisle complimented with our orange sashes and orange buck wedding aisle decorations. The Auburn Botanic Gardens, Scented Garden reflection pool is a water setting outdoor wedding location suitable for a smaller wedding ceremony. It is called the scented garden because of beautiful smells emanating from the surrounding garden lavender, sage and frangipani’s. A limited number of wedding chairs will fit the space, keeping it ideal for an intimate wedding hire. The Auburn Botanic Gardens Scented Garden is one of the few wedding ceremony locations you will find with a backup location. The pavilion sits right next to the reflection pool making it ideal for choosing a wedding ceremony locations in the months where rain is possible. The Auburn Botanic Garden pavilion caters for up to 60 people seated and double that when standing. Add a floral wedding aisle to accentuate the entrance and a dash of colour with our sashes and you have a beautiful wedding ceremony setup. 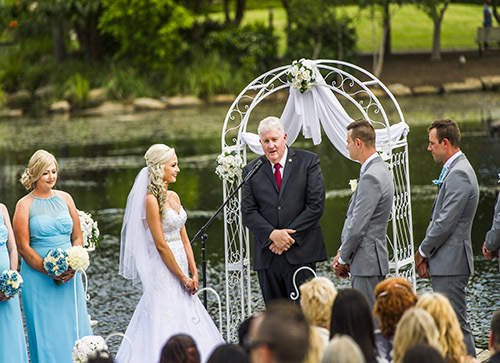 All wedding ceremony hire and setup within the Auburn Botanic Gardens is by booking only and you’ll need to apply via the Auburn City Council. Wedding Ceremony bookings at the garden are limited so you’ll need to book early to ensure you get the location you want. This map of the Auburn Botanic Gardens will help with the layout of the venue and choosing a garden wedding location but you’ll need to visit the venue in person before deciding if its suitable for your wedding ceremony. Adorable Wedding Concepts have styled, decorated and hired to a number of wedding ceremonies at the Auburn Botanic Gardens and our, Princess, Elegancy and Eternity wedding ceremony packages are suitable for the outdoor wedding location. Nurragingy Reserve is a fantastic outdoor wedding location, with a number of garden venues to choose from for your special day. The centre piece the Nurragingy Reserve is the Wharf overlooking the water located directly in front of the Colebee Centre. Nurragingy Wharf – located immediately outside the Colebee Centre, the wharf sits across the water’s edge providing an amazing backdrop. The wharf can cater for small occasions or alternatively has ample room for a large wedding party. The most popular location to get married at Nurrangingy Reserve. Bungarribee Pavilion – sits at the top of the International Gardens overlooking the reserve. It commands sweeping views of the lakes, Chinese Gardens and waterfall. It provides great camera shots for your special day. Power and wedding vehicle access is available on request. Jannawi Garden – an intimate wedding garden location that is semi enclosed in a beautiful setting of lush greens with a tree lined entrance and sweeping views of the lake. Nurrangingy Reserve provides ample parking and is easily accessible for all guests.